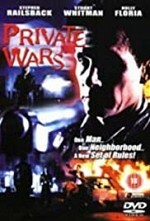 Watch Private Wars: A wealthy businessman is trying to "convince" the inhabitants of an old neighborhood to abandon their homes in order to build a huge business center there. To achieve his goals, he bribes the police and uses organized bands to intimidate the neighbors. But perhaps this alcoholic ex-cop, Manning, could help them, but how?